Sometimes, when faced with an important decision, flipping a coin to let chance determine the outcome just won’t do. Instead, when life brings us to a crossroads, where two paths diverge and both seem equally walkable, we most often turn to family, friends, and trusted advisors to help us face facts and make the best choice. Or some more cavalier among us might opt for the “Magic 8-ball” approach. Of course, it’s only appropriate that, in the digital age where we have Facebook walls, Twitter streams, and polling sites, important life decisions can now take into account our social graph — or be made by way of some quick online crowdsourcing. The latter approach is the one Mike Moradian is taking in regard to a very tricky decision he’s currently facing. Moradian was accepted into Harvard Business School in December, making him the envy of many aspiring post-graduate entrepreneurs and businesspeople. Harvard’s business school is consistently ranked in the top 5 by just about every publication that tracks such rankings, has a slate of notable alumni, and is a feather in the cap of any resume. On the other hand, Moradian is the founder of CampusBuddy and CollegeBudget, both of which we’ve covered on several occasions, including most recently the launch of the latter. CampusBuddy, which offers college students a social platform where they can also access official grade records and view comprehensive reviews about professors, classes, departments, and campuses, currently claims over 200K monthly active users, with over 1.5 million total, and the startup’s revenue has quadrupled over the last year. And with the enormous popularity of group buying and daily deals, CollegeBudget, which launched last week to bring those two very things to college campuses across the country, could potentially have a long life and a few dollars worth of revenue potentially in store. CollegeBudget, in particular, is what Moradian is most excited about; it’s really the main reason he’s considering not attending Harvard, as it’s an idea that will require a lot of legwork to build into a legitimate business, whereas CampusBuddy is more stable, he said. Thus, one can start to see that Moradian does have a difficult choice in front of him: Does he leave his startups behind and enter Harvard’s MBA program, or does he regretfully decline Harvard’s offer and help build his businesses into what could be multi-million dollar enterprises? Moradian, who was ranked (along with CampusBuddy) as America’s Best Young Entrepreneur in 2010 by Bloomberg Businessweek, tells me that he knows he can’t do both; if he were to attempt to split his time, he would be doing a disservice to his startups and to Harvard. So, he’s decided to turn the decision over to the masses via crowdsourcing. And whatever the crowd decides, he will follow through on their choice. He’s serious about it, because he knows he’s fortunate to have the choice in the first place. He has opened up voting on this landing page, so users can vote here. Moradian opened up voting last week to CollegeBudget users, and over 20,000 people have cast their votes. 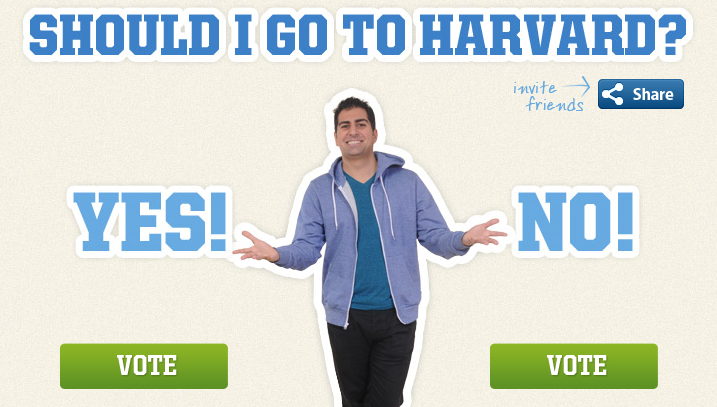 So far, it’s 53 percent to 47 percent in favor of Harvard. Moradian’s decision to crowdsource this choice is especially interesting in light of the recent debate over the efficacy of higher education in the U.S. Back in April, TC’s Sarah Lacy wrote a post detailing Peter Thiel’s thoughts on how higher education is currently the next bubble along with his founding of the “Thiel Fellowship” that financially and conceptually encourages young people to “stop out” of school and pursue their entrepreneurial and creative dreams. The project itself as well as the ideas inherent to Thiel’s foundation stirred up some heated debate, including responses from Vivek Wadhwa and Thiel Fellowship winner Dale Stephens. As for Moradian, he understands that the rising cost and inaccessibility of education is one of the biggest problems facing young people in the U.S., and staying with his startups would help him do that. Yet, when Harvard sends you a letter of acceptance and with that comes the inherent promise of becoming better schooled in the right ways to tackle these large problems, it’s difficult to say “no”. So, what would you do? And what do you think Moradian should do? Vote here, and let us know in the comments below.